Listen to one (so far) unreleased Thräshers song here. 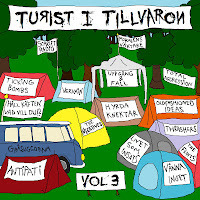 Taken from the swedish comp serie "Turist i Tillvaron". Out in april/may. We will get a few copies as soon as its released in case anyone is interested. BK-11 recording session for "Hotet Från Skogarna"
Giftgasattack 5" - OUT NOW!!! Thrsäshers flexi 7" back in stock! Desperat - Aldrig en lp?